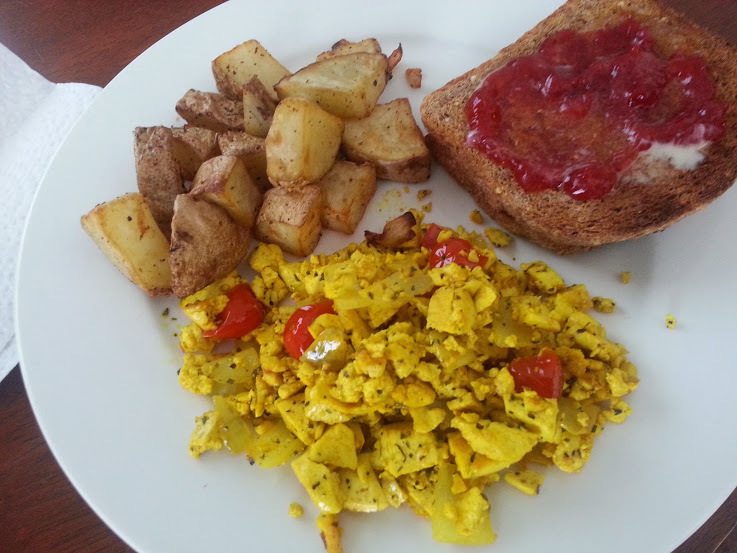 Tofu scramble with home fries toast. It’s a rainy day, mild temperatures above zero, which makes my place kind of chilly because the heater doesn’t run as often, it’s damp and there is no sun. On the positive side it is warm enough to go outside to walk. On the negative side it is very wet out and now all the snow has been washed off the ice leaving slippery trails. It is supposed to stay mild all week though, so maybe on another day with less rain I will venture out. For today, I am housebound. I didn’t blog yesterday because other than cooking and cleaning in the kitchen I really did little else. What a fabulously relaxing and rejuvenating Sunday! I got up around 8 am, had some fair trade organic Ethiopian dark roast coffee while I tidied up the kitchen from the night before in preparation for a day of cooking, eating, and more cooking. On Friday night I bought a few packages of extra firm Blue Menu brand tofu because it was marked down by 50% on account of the best before date being the 18th or yesterday. You can freeze tofu, which I did when I got home, so that was a pretty good deal. Tofu was on my shopping list because I’ve been craving it, or more specifically using it as eggs for a scrambled breakfast and in an eggless salad sandwich. I have not gone full vegan yet, so I do still occasionally eat eggs. I just had a big omelet for breakfast when I was in Fredericton a couple of weeks ago. That was the first time I’d done that in a good long while though, normally the eggs sneak into my diet through baked goods where I don’t actually see them. The omelet was good but I think it was my last one. I’m sure it was an awesome omelet but I found myself not really liking the texture or the eggy taste or the way it made my stomach feel. One egg in a breakfast sandwich I might be able to do but the days of three egg omelets are over for me I think. But ever since then I’ve been craving tofu “eggs”, which is something I never ever imagined would happen. So yesterday morning I drained a block of tofu and set it between two plates to press for 20 minutes while I washed and chopped some russet potatoes to make home fries. Have I mentioned how much I love the tFal Actifry I got for Christmas?! OMG! I freaking love it! After I washed and chopped the potatoes I just put them in the Actifry with a teaspoon of oil and added spices (sea salt, pepper, paprika). I also chopped half an onion and added it, but next time I would wait until the potatoes were almost done before I added the onion as the end result was crispy crispy onion bits. Just throw it in, set the timer, press start and walk away. It is just so easy! And the result is so much better than what I could have got in the oven or the skillet. While the potatoes were cooking and the tofu was pressing I got to sit and watch an episode of Coronation Street from last week and enjoy my coffee. On Sunday mornings I watch all of the week’s Corrie episodes. It’s something I look forward to all week. I waited until the potatoes were finished before I started making the tofu scramble, because it only takes a few minutes to do. Crumble the tofu, add spices, into a heated pan with oil. I sautee some onions first until they are translucent then add the tofu, spices (tumeric, basil, cilantro, sea salt, black pepper), and then a few grape tomatoes. Mix it all up until it’s heated through then serve and eat! Easy peasy! I had mine with the potatoes, and some toast made from Ezekial sprouted bread spread with vegan Becel and some strawberry jam. Yummy! And just what I was craving. And enough leftovers so I can heat up breakfast this morning too. I reserved some of the scrambled tofu to make eggless salad for wraps and sandwiches too. Bascially you just mix it up the same way you would to make egg sandwiches. Mayo (or veganaisse in my case), a little bit of mustard, and I also put in some sweet relish, a bit of lemon juice, and some nutritional yeast flakes. Makes a great pita or wrap filling. My first loaf of homemade bread! After breakfast and some more Coronation Street I finally got out the new breadmaker and made my first loaf of homemade bread. 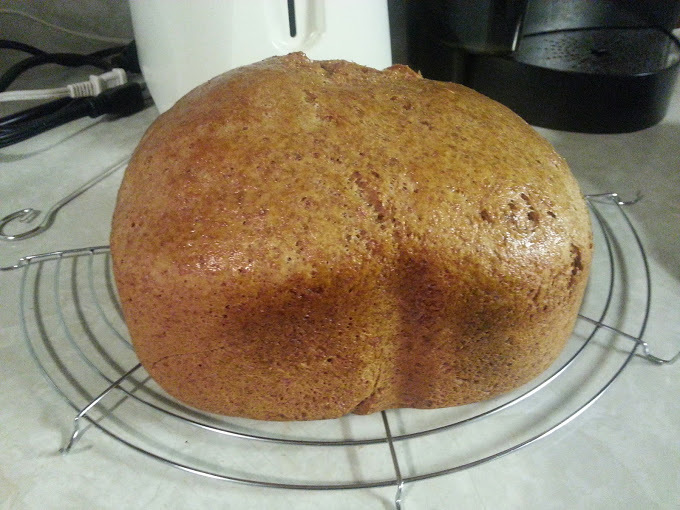 I made a loaf of spelt bread following a recipe I found online, and the basic directions that came with the machine. It was pretty exciting! Especially since when it’s kneading the dough it jerks all over like a washing machine and I needed to keep pushing it back on the counter so it didn’t fall on the floor. There will not be any unsupervised bread making on that counter top. I was pretty happy with the result. It is bread! And it is vegan! I can’t wait to try other recipes now! 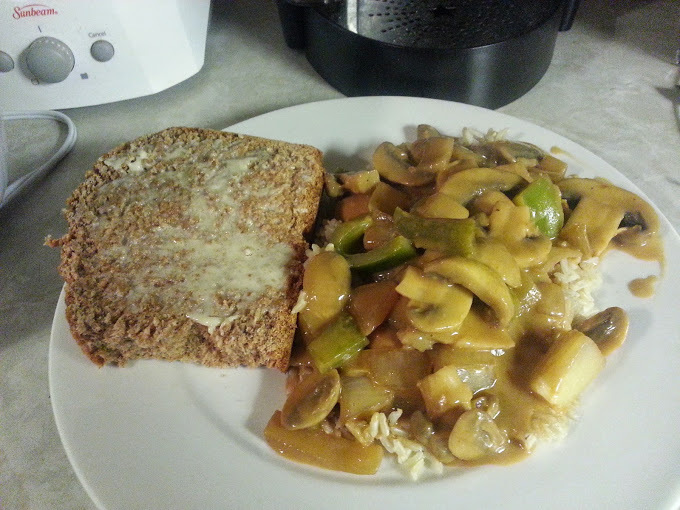 Veggie stir-fry in spicy peanut sauce on a bed of brown rice, with a slice of homemade spelt bread. My time in the kitchen wasn’t finished with the bread baking experiment though. I hadn’t eaten anything since breakfast so I was hungry and had a craving for dinner. I decided to whip up a quick veggie stir fry in spicy peanut sauce with brown rice. I love the sauce I make from peanut butter, Sriracha, coconut milk, rice vinegar, soy sauce and spices. It’s sweet and sour and spicy all at the same time and I could literally eat it with a spoon like soup. Very yummy! I didn’t have many veggies on hand, normally I will add a bit of a frozen medley to the fresh to mix it up and make it interesting, but I didn’t have any in the freezer so it was just onions, mushrooms and green peppers. Still the end result was delicious as always. And plenty of leftovers for another day. So I didn’t go on the computer at all yesterday other than to reference recipes and watch some TV, which was a nice break. Getting into the kitchen and doing some cooking is a great way to nourish my soul, and make sure I’ve got some good food already cooked in the refrigerator for the week.